Join us for a digital reputation management seminar on February 21st, 2019. 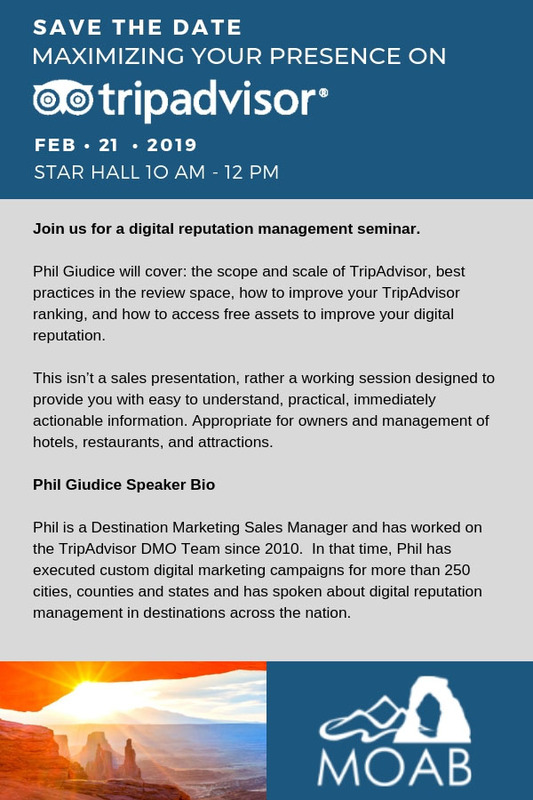 Phil Giudice will cover: the scope and scale of TripAdvisor, best practices in the review space, how to improve your TripAdvisor ranking, and how to access free assets to improve your digital reputation. This isn’t a sales presentation, rather a working session designed to provide you with easy to understand, practical, immediately actionable information. Appropriate for owners and management of hotels, restaurants, and attractions. Phil Giudice is a Destination Marketing Sales Manager and has worked on the TripAdvisor DMO Team since 2010. In that time, Phil has executed custom digital marketing campaigns for more than 250 cities, counties and states and has spoken about digital reputation management in destinations across the nation. This seminar is brought to you by the Moab Area Travel Council.